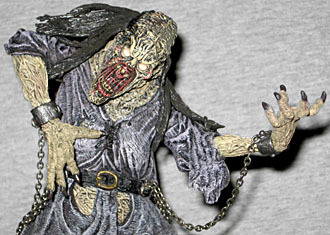 While reviewing NECA's Evil Dead Henrietta, we were all surprised to find that nobody had ever reviewed the Army of Darkness Pit Witch. Heck, I took and edited photos of her in 2002, but never did the writing. Time to correct that! Todd McFarlane never really "got" Army of Darkness. He didn't want to make Ash at all, and despite the movie being full of skeleton monsters with distinct designs, he only ever released one Deadite. One! How do you seriously release just one creature from that movie? And then, how do you only sell that single creature in an exclusive two-pack? After being sent back to the year 1300, Ash was mistaken for a vassal of Henry the Red, Duke of Shale, Lord of the Northland and leader of its peoples - aka, "Mr. Fancypants." And since Duke Henry had been warring against Lord Arthur, Ash found himself chained, enslaved and tossed into a pit - a pit where the last man who went down inside came out as a geyser of blood. 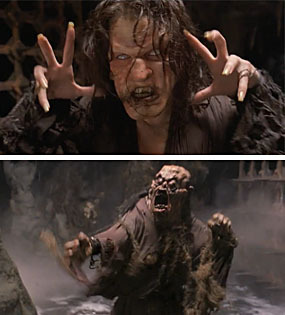 There were actually two witches in said pit, and so when McToys' representative on the message boards told us they were making a Pit Witch, it inspired quite a debate (aka, "a nerd fight") about which one it would be. Would we be getting the fast and more traditionally Sam Raimi-ish one who kicked the crap out of Ash until the wizard threw him his chainsaw, or the second, chunkier one who was much more decayed and monstrous. Of course, this being McFarlane Toys, we should have known the answer right away. The witch's stringy hair droops around her shoulders, but it still looks too thick and solid. As much as we dislike rooted hair, it really would have been a better choice on this figure. If you look at the film, what little hair there is is sparse and whispy - this hair looks more like the Hulk Hogan 'do (long on the sides, absent on the top). It shouldn't be construed as a deal-breaker, by any means; we're just saying that there was a better way to do it. 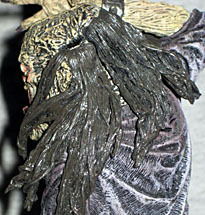 The Pit Witch is wearing a tattered grey robe, which is not only sculpted with all the wrinkles and folds you'd expect, but a specific texture to the cloth as well. 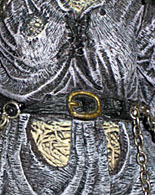 The lower edge is even sculpted to look frayed. Her skin is wrinkled and puckered, with prominent veins snaking their way over the rotting flesh. The level of detail lowers as you near the center of the body, but you have to look up under her skirt to notice, and nobody wants to do that. She's going commando! 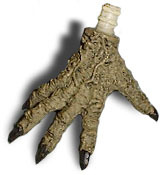 This is a McFarlane toy, so you know the articulation is going to be crap. That's just the nature of the beast. She moves at the neck, shoulders, wrists, hips, and nothing else. They didn't even give her those useless swivel elbows that a lot of toys used to have. As is typical for a Movie Maniac, she has one "correct" pose and looks bad any other way. Unfortunately, her pose is very dull. Yes, the legs are dynamically posed, but her arms are held close to her body, so she looks more defensive than offensive. They tried to make her threatening, but the bad joints just kill it. As we said, this figure was sold in a two-pack with the same Ash that was available in Movie Maniacs 3. All the accessories in the set belong to him, but the Pit Witch still gets a little something. When she attacks Ash he does what he does best and chainsaws off her hand - to allow you to play the same way, her right hand is removable. "Removable." In the sense that it's incredibly difficult to remove. It feels like you're just pulling a normal peg joint apart. If I didn't have a decade-old photo proving that the hand came off, I would have sworn it was attached. She also has chains connecting her limbs, but those aren't really accessories. The Ash/Pit Witch two-pack was a Mediaplay exclusive - which means Musicland, Sam Goody, etc. That whole family. Since she was seemingly released in late 2001, I probably got her at Suncoast. That also explains why I have two Ashes, since Todd didn't have the good sense to release her by herself. 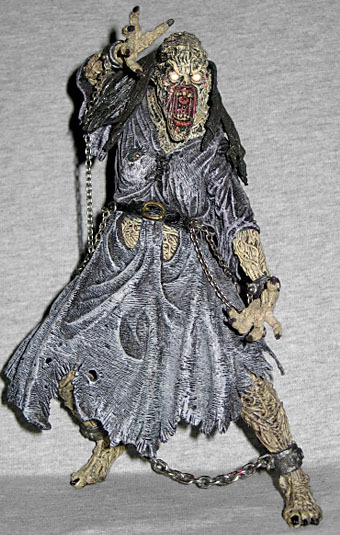 Considering that this is one of only two Deadites ever released in the 7" scale, she's almost a must-have. Just be aware that this is more a piece of scenery than an action figure.